Angangueo is a town and municipality located in far eastern Michoacán state in central Mexico. The town of Angangueo is officially called Mineral de Angangueo to distinguish it from the rest of the municipality. Angangueo is located in high rugged forested mountains, with the town in a small canyon. The town was officially founded shortly after a large mineral deposit was discovered in the area in the very late 18th century. The mines gave out in the 20th century, but promotion of the area due to its proximity to Monarch Butterfly Biosphere Reserve has brought in some tourism. As municipal seat, the town of Angangueo, is located in the far northeast of the state and is part of the Tlalpujahua region. About half of the municipal population of 9990 (2005) lives in the town proper. Its geography is part of the Trans-Mexican Volcanic Belt and the Sierra de Angangueo. It is very mountainous terrain with an average altitude of 2,580 meters. It is mostly covered in forests of conifers with pines, oyamel and juniper as well as mixed forests of conifers such as cedar with broad-leafed trees. Two rivers pass through, the Puerco and the Carrillos along with several arroyos. Wildlife include weasels, rabbits, squirrels, skunks, deer and various birds. Much of the municipality is part of the Monarch Butterfly Biosphere Reserve, especially Cerro de las Papas, which contains a major colony of the butterflies each winter. Angangueo has a spring like climate. Some areas receive rains only in the summer and other all year round. According to the 2005 census, there were sixteen people in the municipality who spoke an indigenous language, mostly Mazahua and Mixe. There is no agreement as to the origin of the name. It has been translated as “entrance to the cave,” “very high thing” and “inside the forest”. The municipality has its own coat of arms divided into three sections. One has symbols referring to mining, the second with a representation of a monarch butterfly and the third with mountains and the sun representing the terrain. When Nuño de Guzmán arrived to the area in 1550, he described it as a “no-man’s land” with no indication of the riches that were underneath the mountains and forests here. The lands were awarded to Gonzalo de Salazar by viceroy Antonio de Mendoza as part of a larger area encompassing Zitácuaro and Taximaroa shortly thereafter. Some mining and settlement began in the mid-16th century, but it remained relatively unpopulated until the very late 18th century, when large deposits of minerals were discovered on what is now called the former hacienda of Angangueo. These minerals included gold, silver, copper and more and brought a rush of people into the area. The town of Angangueo was officially founded in 1792 and it became a municipality in 1831. During the struggle between Conservative and Liberal forces in Mexico in the 19th century, possession of the town changed hands. In 1865, General Régules took the town plaza for Conservative forces but Liberal forces retook the town the following year. The Temple of the Inmaculata Concepcion was begun in 1882. In the middle of the 19th century, mining rights were assigned to an English company called Negociación Minera de las Trojes. In the 20th century, it was then conceded to the U.S. company American Smelting and Refining Company, the last foreign concern to have mining rights. In 1953, an accident in the Dolores Mine claimed twenty five miners and the federal government expropriated the area. It was then managed by the Impulsora Minera de Angangueo, which continued mining here until 1991, when it was decided that the exploitation of the mines was no longer economically feasible. From then to the present, there have been disputes between the shareholders in the Impulsora and former miners and the state of Michoacan over the right to continue mining. The mines are considered to be part of the butterfly reserve. In the mid-20th century, the town has a population of 10,000, its own newspaper and even a mint. However, it has steadily declined since then as the mines gave out. The town gained a new source of income with tourism with the establishment of the Monarch Butterfly Biosphere Reserve and the promotion of the butterfly colonies located very near the town by magazines such as National Geographic and Mexico Desconocido, beginning in 1980. This has promoted the opening of hotels and restaurants near the butterfly sites, and small transport services thereto. However, this has not brought the town back to its former size. On 5 February 2010, heavy rains and hail caused flooding and mudslides in the region, with Angangueo being hard hit. Landslides on two of the hills surrounding the town buried sections and blocked roads. Many houses built on the riverbanks were swept away. The deforestation from legal and illegal logging contributed to the landslides. In addition, cleared areas on hillsides were used to build homes. As an alternative to mining, was suggested developing tourism in Angangueo as a Pueblo Mágico. Later the same year, federal authorities announced that no new residents could move into the town and that the current population would be relocated. The decision was made with the rationale that the landslides create too big a hazard for people to live in the current location and a “New Angangueo” would be built. However, local residents were against the plan. Efforts to relocate the town were officially begun in June 2010, with a projected 600 homes in a location called Barrio Sustentable Monarca. The construction was halted by September of the same year, with only a layout traced on the site and no new homes started. Like most mining towns, Anguangueo has an irregular layout of its streets and blocks, which has remained the same since colonial times. There is one main road, which is called both Nacional and Morelos. This road leads up the canyon and ends at the Plaza de la Constitución. Most of the houses around the town are made of adobe with wood details and red tile roofs. There are also balconies which contain pots with flowers in the summer. Like a number of other mining towns from the same epoch, there are a number of tunnels that connect buildings, like the one that connects the Casa Parker with the Inmaculada Concepción church. The main plaza is flanked by two churches: the parish of San Simón and the Inmaculada Concepcíon. The clocks on the two churches often show different times. The Inmaculada Concepción church was built by a single family, in pink stone in Gothic style to imitate in miniature the Notre Dame Cathedral in Paris. The main altar was made of marble from Italy, with images of Saint Joseph and the Virgin Mary from Paris. The tabernacle contains the “chalice of Angangueo,” an important example of Baroque silverwork. The San Simon parish is smaller, built with blue-grey stone. Other chapels include Santa Maria Gorita, Misericordia and Jesus Nazareno. The Monument to the Miner is located on a lookout over the town and the Señor del Rescate Chapel, which is now the site of municipal offices. The Casa Parker was an old train station. In the mid-20th century, it became the home of Bill and Joyce Parker, and English/American couple. Bill was the last mine administrator of the American Smelting and Refining Company before the mines were nationalized. The couple became part of the community and eventually their house was preserved and made into a historical museum. Another museum in the area is the El Molino. 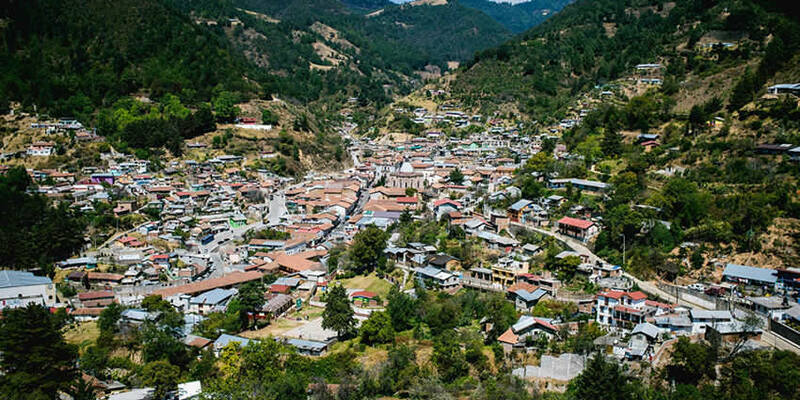 While residents in and around the town still extract some lead and silver from the hillsides, the town is best known for being in middle of much of the Monarch Butterfly Biosphere Reserve, with two sanctuaries open to the public nearby: Sierra Chincua and El Rosario. The town hosts an annual monarch butterfly festival each year in February to bid goodbye as the insects head north again. The festival consists of artistic and cultural events as well as those related to the region’s traditions and customs. Another annual cultural event is the Day of the Miner on 11 July, which is held to honor a way of life that many in the town do not wish to lose. The rest of the municipality’s annual festivals are religious including the feasts of Santa Cruz on May 3, San Simon on October 28 and the Immaculate Conception on December 8. Buses from Mexico City to Zitacuaro $14 (2:45) run each 30 min. Buses from Mexico City to San Jose de Rincon $10 (3:25) run each 30 min. Buses from Toluca to Zitacuaro $3-$6 (2:20 hours) run each 30 min. Buses from Ciudad Hidalgo to Tuxpan $1-$2 (0:20 min) run each 20 min.